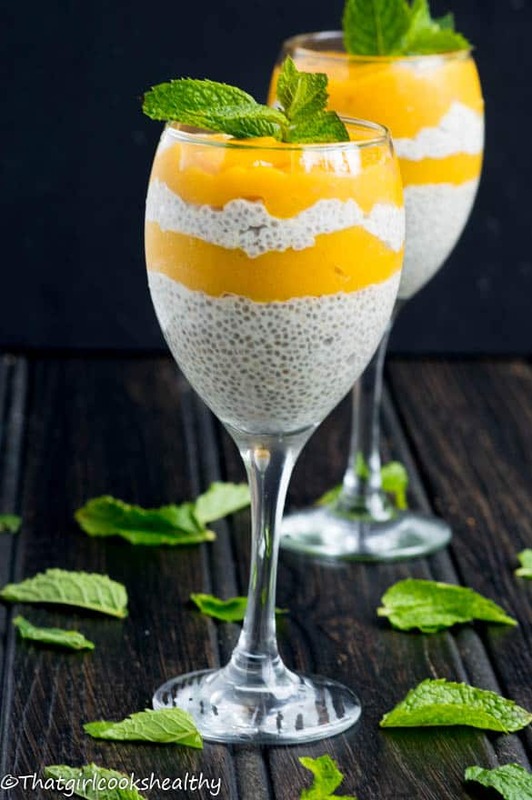 Mango chia seed pudding recipe – Impress your dinner guests with this dairy free exotic dessert made with coconut milk and chia seeds. 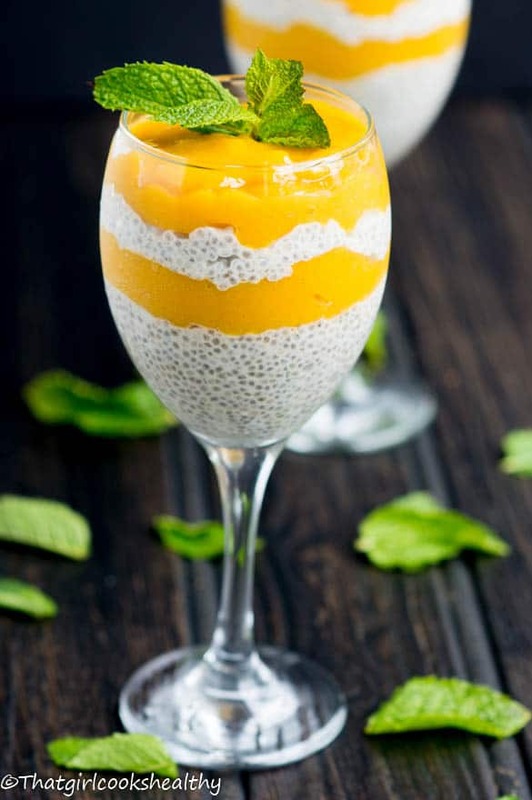 Dessert time just got 100 times better with this mango chia seed pudding. Trust me if you’re a fan of all things mango and coconut then you’re in the right place. Over the past few months I’ve fooling around chia seeds a lot more because I’ve managed to purchase them on special offer, needless to say I have a ton of chia seed stacked up in the pantry. Initially I had no idea what to do with them and I’m pretty sure I’m not the only one. I bet you guys were under the impression that us foodie are knowledgeable on every single culinary item, well that’s certainly not the case with me. Being a health enthusiast means keeping up with the latest trends and contemporary superfood. Right now I would say chia seeds which hail from Latin/south America seem to be creating quite a storm. It was my mother who introduced me to chia seeds, she’s a health buff like me, but usually I’m the one who schools her on super foods so this was rare moment which of course she relished in the opportunity of outsmarting me. Anyway, after a month of conducting some research I quickly realised how amazing chia seeds really were. These little black dots when saturated have the ability to swell in size and yield a gelatin type of agent. 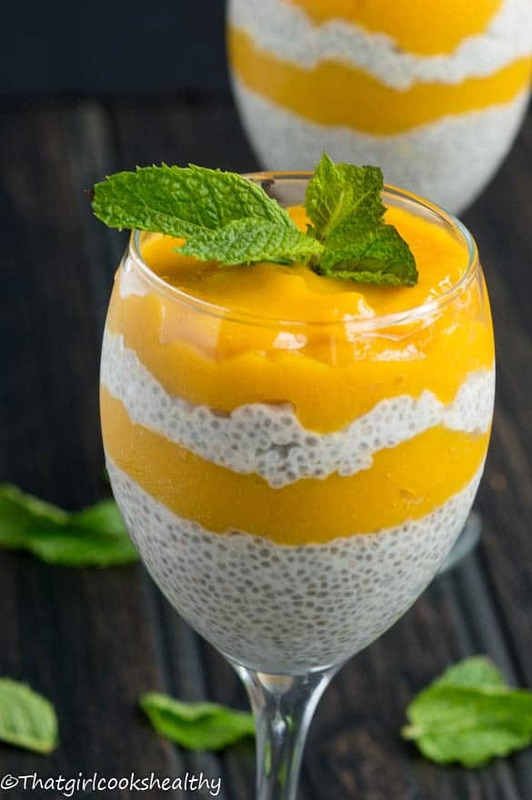 This thick substance is often used in place of eggs in many vegan recipes, similar to flax eggs or to make recipes like this chia mango pudding. One of the cool health benefits of chia seeds is it digests slowly because they are full of protein (amino acids) and fibre (support the gastrointestinal tract). They’re also a good source of omega 3 fats and don’t contain any cholesterol, so if you’re looking to increase any of the aforementioned then simply add some chia to your diet. The recipe at hand contains only one Indian spice which is commonly used in ayurvedic medicine – cardamom. Cardmom is often used to relieve a number of health issues, ranging from mouth ulcers, inflammation of the eyelids, renal problems right down to gastrointestinal disorders – it’s a highly multi purpose, pungent spice. I think cardamon compliments mango providing its not used in excess only 1/4 teaspoon is suffice, anything more will overpower the recipe. Activating the chia seeds – For the prep you’ll need to give yourself at up to an hour or preferably overnight for the chia to expand in the milk. Unfortunately there’s no magic wand that can hasten the swelling stage. I like to do this overnight where possible as opposed to playing the waiting game. Use a large bowl – Allow the chia to expand in a large jar for obvious reasons or a bowl (covered) it will absorb most of the milk, so don’t be alarmed this is normal, you can add a splash of milk to loosen up the texture if you wish. As you can see from the pictures I created afew colourful layers, you can follow suit or simply style it the way you desire. The yellow layer is simply mango that’s been pureed. Additional sweetened isn’t required (assuming the mango is sweet) just be mindful of that. Always inspect the mango prior to purchasing, there should be no bruising at all. In order to determine the ripeness of a mango it should feel soft when squeezed with a strong sweet smell. You want a mango that is really sweet so it’s easier to work with and will compliment the taste of your overall dessert. I appreciate that not everyone is a fan of coconut milk which is perfectly okay. You can replicate the exact same result using almond milk or in fact any other nut milk. Simply do a direct 1:1 ratio substitution using 2 cups of almond milk in place of coconut milk. 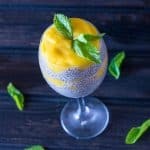 Mango chia seed pudding is………..
I’m not sure if she used wine glasses or bowls to make the recipe, so this comment is dependant upon how it is served. Regardless I suggest working with two pureed mangoes and freeze any leftover mango in a freezer friendly container. This will guarantee that there is enough mango to spare. Don’t delay make chia pudding today!! Pour the chia seeds into a mason jar or medium sized bowl and mix with the coconut milk, cardamom, vanilla and coconut nectar or date paste. If using a mason jar simply put the lid on, shake well and refrigerate for up to an hour or overnight. If using a bowl simply give the contents a good stir, cover and refrigerate. After the given time the chia seed will appear translucent, congealed with the milk into a creamy white jelly type of consistency. Prepare the mango, stand the mango upright and use a paring knife to slice the left and right of each side vertically so the centre is remaining, then slice the sides and discard the stone. Push skin of the mango inwards so the flesh is exposed and cut into crisscross grids,be careful not to drive the knife through to the skin. Run the knife lengthways underneath the grid to separate the flesh from the skin. Serve accordingly – mix together or in layers – your choice and enjoy! WOW! 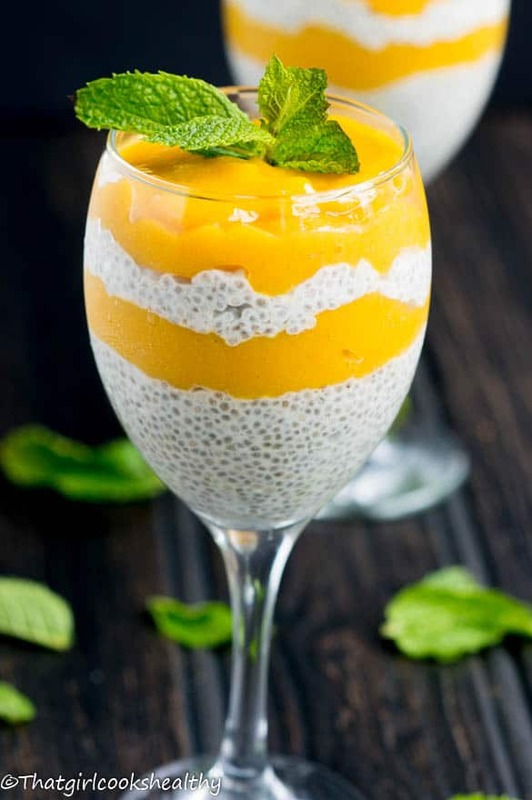 Just love the combination of mango and chia. I need a bowl of this like yesterday…. What a great color contrast you’ve got going on here Charlene. Beautiful! Thank you so much and I followed your tips on dark photography. What a beautiful dessert! I love that you have kept the ingredients as unprocessed as possible. Thank you so much your comment means a lot to me. I need this in my life right now! I have a love affair with chia seeds! HAHAH Go on try it! LOL I also just got a *large* bag of chia seed – because I found a sale. (Himself keeps looking at it dubiously…) So now I have to learn what to do with them! Your recipe looks like an excellent start. Honestly the things you can do with chia seeds are endless. Thanks, Charla! I really enjoyed this recipe. I’m soo glad that I found your website. Thank you so much Ceil. Your feedback is highly encouraging. How many would you say this recipe serves? Trying to figure out how much to increase it by for a party. Thanks! Hi Karen, it serves roughly 2-3 people if served in a glass as pictured. Let me know if you need further assistance. Made this for a dinner party. Everyone really liked it. It was many of our first times eating chia pudding so I was worried about the texture because it kind of is weird and isn’t everyone’s cup of tea. But multiple people went for seconds so I think it was a hit! Only suggestion would be for more mango. We ran out of mango before the chia seeds. Maybe 1.5 mangos would’ve been better. So glad that you liked the pudding recipe Mary. Thanks for the feedback I will definitely make a note of that for future reference. This was fantastic! 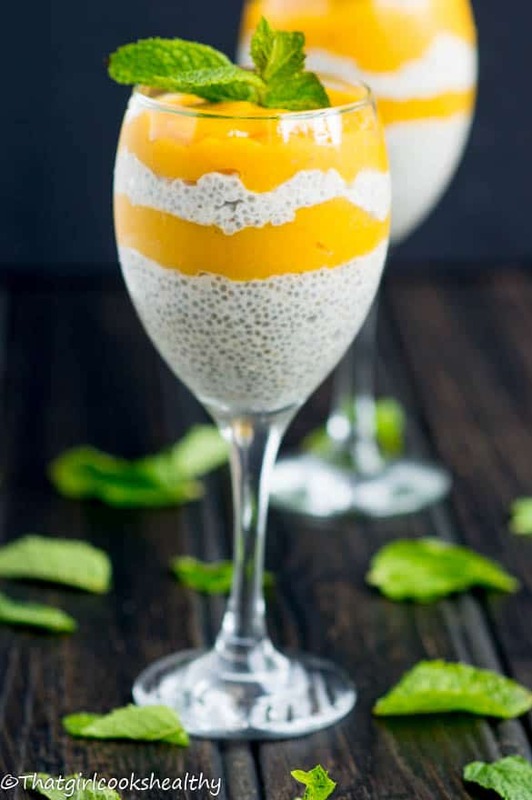 I’ve only ever activated chia seeds in water before — this pudding was amazing. I will be using it a lot, both with and without mango. For this recipe I used frozen mango chunks (purchased frozen at the grocery store), and made them into a whipped sorbet in the food processor. Thank you, thank you! Hey Raquel. I’m so glad to hear you enjoyed it! !